Raker-Roberta’s color-filled trial gardens in Litchfield, MI, are a mix of displays, hanging baskets, and container combinations, and comparison trials. Visitors to the 2018 Michigan Garden Plant Tour not only had the chance to evaluate plant performance this year — they discovered that with plants, anything is possible. Four leading young plant producers and Michigan State University opened their trial gardens for the annual event, providing visitors from around the country with ideas on how to use and market the latest plants in new ways. 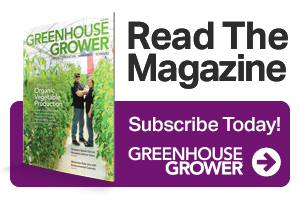 Now in its 15th year, the annual tour is a coordinated open house held to educate growers and industry professionals about new and existing plant selections and their performance in different settings. Mother Nature hurled the best and the worst she had to offer at the cornucopia of new varieties sprinkled throughout the gardens of the five stops along the tour. All things considered, the gardens were beautiful and the new plants were plentiful. The trial gardens at Raker-Roberta’s (formerly C. Raker & Sons) in Litchfield, MI, blazed with vivid color the week of the tour, notwithstanding blistering-hot temperatures. The nearly 100,000 plants in the garden, a mix of displays and true working trials, filled breeder-sponsor rows, hanging baskets, large containers, and landscape beds, representing plant material from 22 breeders. This year, the trials included side-by-side comparisons of SunPatiens, Sun Harmony, and SunStanding impatiens. Twice, deer wreaked havoc on the side-by-side trials of BIG, Whopper, Megawatt, and Tophat begonias. Even a Liquid Fence application after the first occurrence didn’t deter them. Raker-Roberta’s continued its overwintering trials of gaura, Phlox paniculata, and veronica (4th year), along with coreopsis, leucanthemum, and lavender (3rd year). Another appealing feature was the expanded perennial showcase featuring the latest plants from breeders and landscaped perennial beds that have been in the ground for at least three years. Twelve raised sponsor beds overflowing with perennials, farm-to-table produce, and All-America Selections showed off new plant material in landscape settings that mimicked real-world applications. Visitors to Walters Gardens display gardens had the opportunity to see the bare root beds in full bloom near Zeeland, MI. 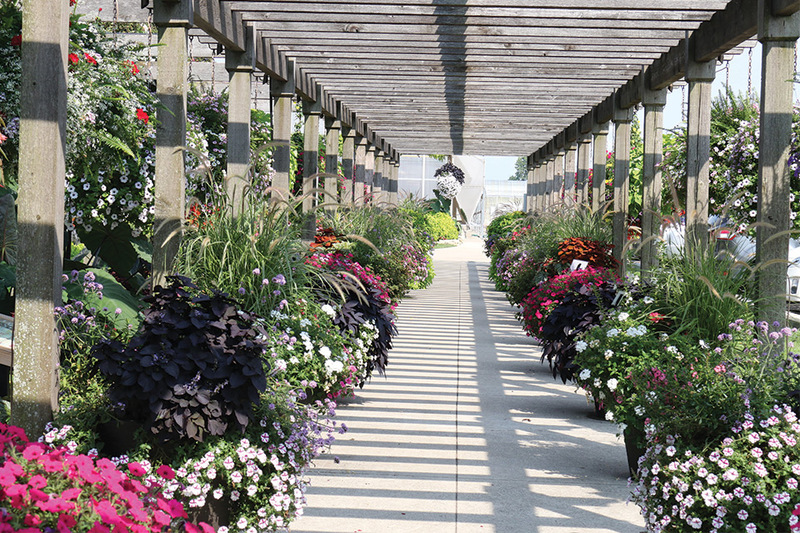 Nestled outside Zeeland, MI, Walters Gardens’ expansive display gardens exhibited new perennial varieties and Proven Winners’ perennials in showcase beds and natural settings. An accompanying retail-ready display offered ideas for positioning product in stores with engaging signage and set-up. Walters also showed off its new 15,000-square-foot Acclimation Range, where it will grow more than 1,000 different varieties of perennials and temperennials started via tissue culture or as unrooted cuttings. It will eventually add seeded items to the mix. The range is a DeCloet structure equipped with Cherry Creek booms, Damatex controls, DRAMM cooling, heat retention and shade curtains, and a heated floor. A diffused-glass roof provides uniform light coverage for the plants. This is the highest range Walters has built so far, measuring 19 feet from floor to gutter. The high ceiling helps maintain the right amount of humidity in the house. Special misters, used in the automotive industry, help cool the air and regulate humidity. The Acclimation Range is the final phase of a three-year project at Walters to replace outdated propagation facilities and add shipping space. Walters also toured visitors through its bareroot perennial fields. 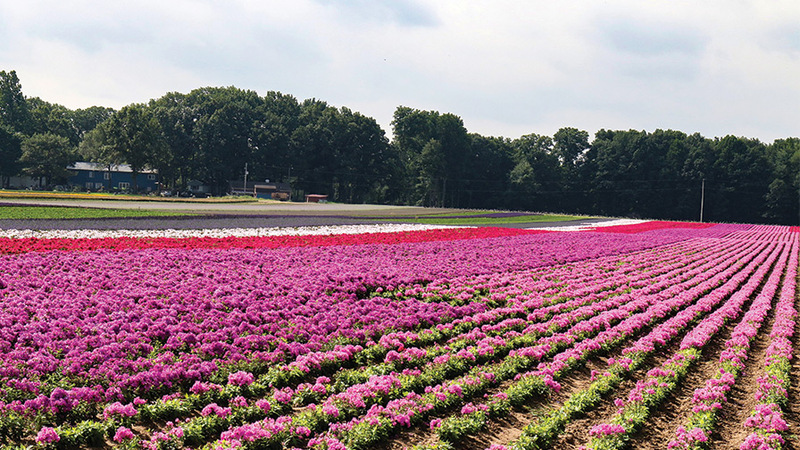 The operation processes all of its bareroot products at the Zeeland facility, with the exception of hibiscus. In Walters’ research greenhouses, Trial Manager Laura Robles just completed an extensive bareroot grow-out trial started in February and planting every three weeks thereafter, to examine differences in timing. This year the trial included hosta, allium, salvia, sedum, and other varieties. 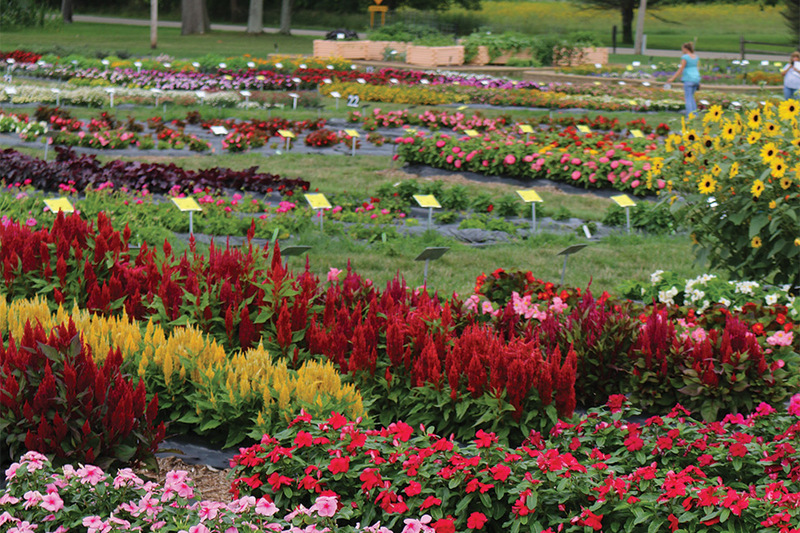 The 14-acre MSU Horticulture gardens in the heart of the East Lansing campus swelled with masses of annuals, perennials, and woody plants. New this year was the Garden Noire, featuring plants with black foliage, flowers, or fruits. Additionally, the succulent trials were back for a second year. They included more than 80 tender succulent varieties that trial managers are evaluating for outdoor growing in Michigan landscapes. Carpeted with color throughout the spring and summer, the display garden at Mast Young Plants is a living catalog of the varieties it offers in its liner program, including more than 1,300 varieties from 20-plus breeders and more than 300 custom combination planters and hanging baskets. This year Mast Young Plants opted for an open comparison trial, featuring plectranthus (coleus), and verbena, over a blind comparison trial. Visitors voted on their top three favorites, with votes tallied daily. Mast Young Plants announced the winners at the end of week 36 and plans to add the winning coleus, ‘Stained Glass Royalty,’ to its 2019/2020 catalog. The top verbena, ‘Meteor Shower,’ will move to the next round of trialing in Mast Young Plants’ Innovative Department. Another change this year was the decision to present varieties in 14-inch Pantera pots with a brick placed underneath for better drainage. The roomier pots gave the plants more space to grow with a 4-inch center, and Mast Young Plants’ General Manager Brian Weesies says this improved the appearance and performance of each pot. Mast Young Plants showed visitors the possibilities for using new varieties in the garden, with plants displayed in flowerbeds, hanging baskets, deco pots, window boxes, saddle planters, trellises, and pergola and pond planters. A remarkable display of custom basket combos, designed by Grower Michael DeBerti, demonstrated the endless array of combinations available for retailers to make up for their customers. Each combination included an ingredient list to help customers recreate their favorites. Combo Alley at Four Star Greenhouse’s display garden in Carleton, MI, was a lush display of hanging basket and container combinations that included the newest Proven Winners National recipes for 2019. Four Star Greenhouse’s Carleton, MI, display garden caters to audiences of all levels of gardening experience, with the bonus of providing plenty of take-home ideas and inspiration. Based on a different concept than a traditional trial garden, the Four Star display garden had an organic flow and original bed layout this year that combined to create individual spaces where visitors could get lost a bit with the display all around them, says New Product Development Manager Josh Miller. This year Signature Garden Designer Ian McGreevy designed new signage with simple, illustrated identification guides for the garden that listed the annuals used in the bed design and offered growing tips from Four Star staff. The signs accompanied each of the 16 display beds, allowing visitors to take a self-guided tour. Four Star’s display beds of annuals centered on 16 foundational plants that create a balanced design when used together. Warm orange, yellow, and pink colors reigned near the pavilion while cool blues predominated in surrounding garden beds. “Featured” badges identified the 16 must-have plants in the garden. 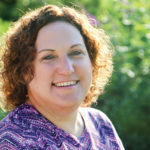 A line-up of monoculture pots containing new variety introductions for 2019 gave visitors a quick look at what Four Star offers, and in the Combo Alley, visitors caught a sneak peek of the 2019 National recipes for hanging baskets and uprights. Thank you for the mention of All-America Selections in this article. We appreciate the support.